Creating an enjoyable and beautiful workspace not only makes an impact on customers and clients but also helps to create a better, healthier working environment for you and your employees. Our green interior design and indoor landscaping services in Atlanta and surrounding areas of George are focused on making spaces beautiful, striking and serene so everyone can enjoy it. Whether you want to redesign a small office where you or your employees work, a lobby where your customers first see your business or a central area that everyone uses, we can help you create the perfect space. 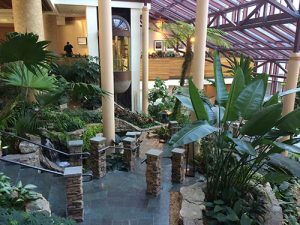 Indoor landscaping and green interior design immediately makes offices, lobbies, lounges and atriums feel more open, airy and uplifting. The natural color, freshness, and life of trees, flowers, and plants bring an element of the outside in, making the space less constricting. Extensive studies have shown that natural elements such as plants, trees, and water elements have calming effects on all of us, lowering stress, stimulating creativity and promoting positivity. This creates a more enjoyable working environment, which in turn lowers absenteeism, reduces stress, and raises productivity. Our green interior designs can be used to create a relaxing and serene environment, and they can simultaneously create a striking design statement. With a bright and colorful living wall in your lobby, real trees in your lounge, or exotic flowers in your office, your space will make a lasting impression on every customer that comes in. 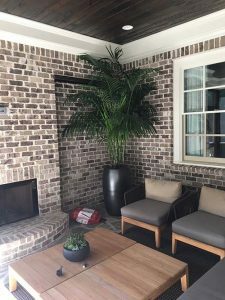 Browse Foliage Design Systems of Atlanta’s work online and call 770-451-0885 today to get started on your green interior design and indoor landscaping in or around Atlanta, Georgia.